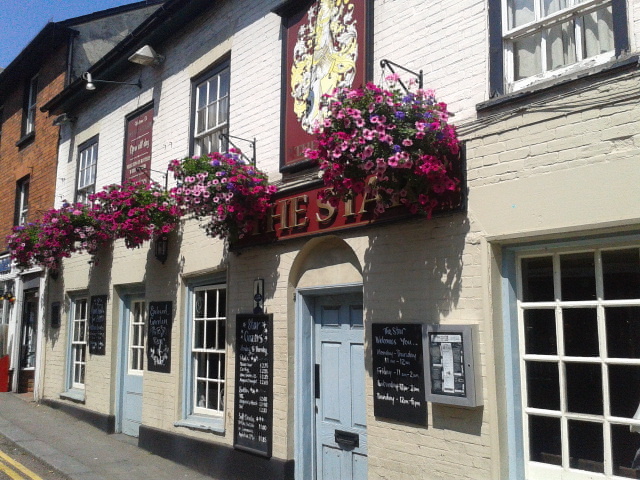 The Star Inn, Bridge Street, Bishops Stortford, claims hostelry back almost 400 years, and like a lot of this quaint town 9 minutes out of Stansted on the track to London, it is kitted out in the flavour of authenticity. Not that there is any need to doubt its credentials and yet I’m drawn to Trigger’s brush in Only Fools and Horses*. That said I have managed as is the norm to get a rickety table, indoors this time, and while there is a spacious beer garden, a tired child and an overdose of sun down by the paddling pool, have us nestling in a shadey recess: though in truth pressed up to the street facing window, and while Tara snoozes I have time to take in the people and the accents, not all of which are local. Lunchtime deal of 1 meal for 6.95 but 2 of the same for 8 is hooking some. I for my part have been pressed to request strawberries from the barmaid, and while only for cocktails, she bends over backwards ( I wish;)) to supply us with a bowl. Having done Cambridge last week I must say I’m much more impressed as, with child in tow, I can traverse the town in short distances. There is a paddling pool in the park, and a kickass playground all within a lazy stone-thrower’s toss away. How I’m going to tell Tara we can’t return to the playground when she awakes I’m still pondering but for now, here, a John Smith’s to hand, chatter hidden away from me, a bit of mellow music, and sunshine abounding, I am L’Homme Heureux! Essentiellement!